First we have a quick update on our newly launched Alpha Club: As a thank-you for your continued support, we've set all existing alpha testers (including our Kickstarter supporters) up with a free six month Alpha Club membership. If you are an existing alpha tester, simply log in at http://modk.it/alpha and start using the Alpha Club features today. The Alpha Club is a membership based club that allows Modkit fans and users to support our efforts while receiving early access to new features as they are completed. We have already launched some exciting Alpha Club features, so consider signing up today and getting involved. We're grateful to all our supporters and Alpha Club members who are helping us bring robotics and Arduino programming to everyone, including children, artists, and everyday engineers. Make sure to spread the word to your friends and colleagues through your social networks as every new member helps us get closer to our vision. Now for some news: Amon will be demoing Modkit at the 10th annual International Conference on Interaction Design and Children in Ann Arbor Michigan this week. IDC's goals are "to understand children’s needs and how to design for them, by presenting and discussing the most innovative research in the field of interaction design for children, by exhibiting the most recent developments in design and design methodologies, and by gathering the leading minds in the field of interaction design for children." Amon officially joined Modkit after earning his Ph.D. from the MIT Media Lab's Lifelong Kindergarten Group for his work including research on physical computing as an extension of the popular Scratch programming environment. Amon's doctoral dissertation was titled "Computer as Chalk" and featured many hand-drawn (actually finger-drawn with an IBM Trackpoint - now that's dedication!) 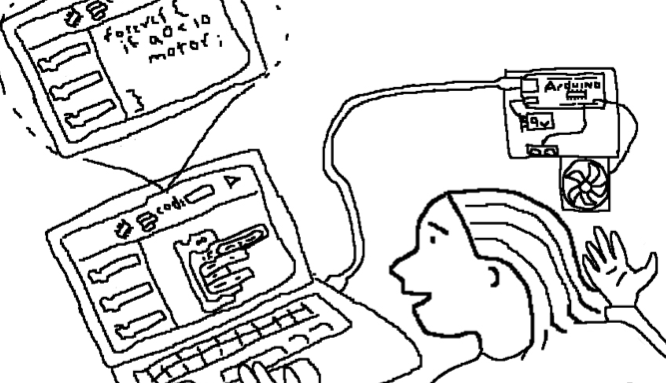 sketches of youth engaged in designing physical computer interfaces such as the above IDC presentation snippet. If you're out at IDC or in the Ann Arbor area, make sure to check out Amon's Modkit demo on Wednesday. Can I Join Alpha Club and pay with Paypal? Because in my country, only Paypal can be accepted with my banking system. Please give me solution for this problem. Finding the correct article, book or master to enable us to begin in website composition can be exceptionally intense, in reality. First of all, for what reason not begin bywordpress website backups pondering the amount we definitely think about websites...?